Today I want to share a couple of cute and easy gift bags I decorated. We have three new babies to celebrate, one girl and two boys. I just love making gift bags when I can!!! 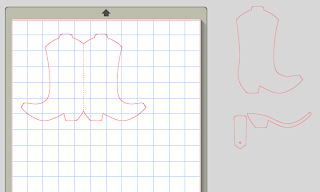 I purchased the elephant from the Silhouette Store and cut it out in two sizes - one to fit the 8x10 gift bag front, and the other to be the tag. 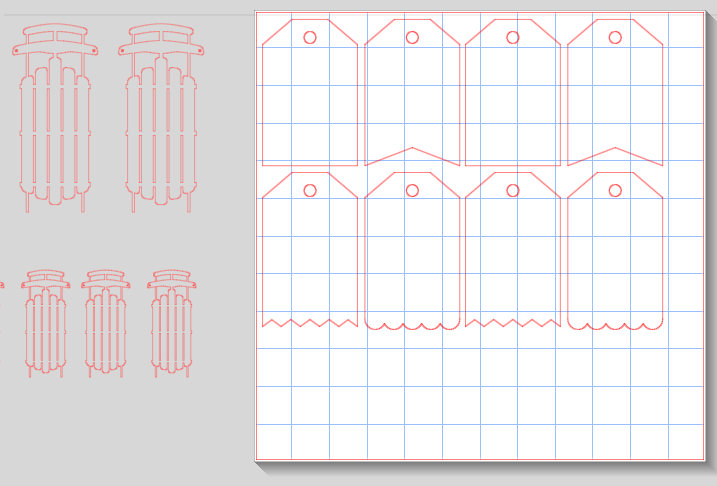 I cut out the first set in pink cardstock. I inked the edges and the ears. I added a flower to her hair. I punched a tiny hole in the tag and used pink twine to attach it to the handle. I put some washi tape along the bottom of the bag - it looks like she is standing in a flower patch!! 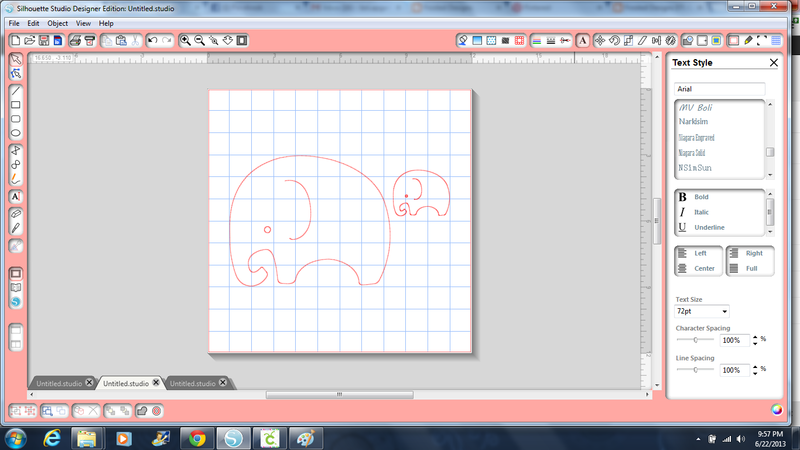 I used a piece of polka dotted cardstock for the first "boy" elephant. I inked the elephants in blue. I gave him a green ribbon bow tie and green gem eye. I put some green chevron washi tape "grass" along the bottom of the bag. I used the same ribbon as the tie to attach the tag to the handle. I used solid blue cardstock for this set of elephants and also inked the edges blue. I did the same bow tie and eye, but used a different washi tape. I tied the gift tag to the handle. I can't wait to tuck the mini baby album I made inside for the new babies. You can see one of my baby girl mini albums HERE and one of my baby boy mini albums HERE. Welcome to the Christmas in July Blog Hop!! 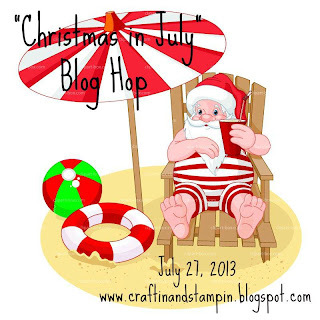 And welcome to the Christmas In July Blog Hop! We have some VERY talented ladies here today to show off some in the spirit Christmas projects for you today! Hopefully once you see the inspiration from this amazing group of women, you will not be worrying last minute about what projects you will make this upcoming holiday! So sit back, relax, and enjoy the hop!! 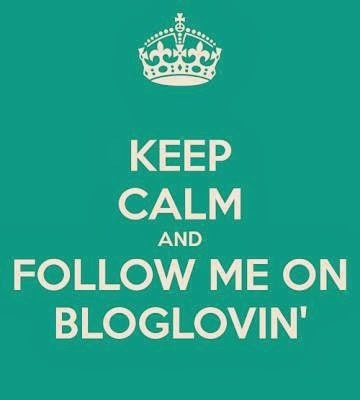 You should have arrived from ANITA's blog, if not, please start HERE!! I made a card and matching tag set. I really like the red runner sled and found one in the silhouette store. I cut out a few sleds and tags. I used my Martha Stewart Branch Punch to create the wreath for the sleds. I added some stickles berries and a twine bow. Behind the sled, I used washi tape to create a border. I used a sentiment from Cardz TV stamps "Christmas Joy" on the inside of the card as well as the front of the tag. I tied a red striped ribbon to the tag. My card with matching tag are all ready for a special gift! Thanks for stopping by today - I hope I inspired you to create a little Christmas in July!!! Your next stop in the hop is HERE. Here is the lineup if you get lost along the way!!! 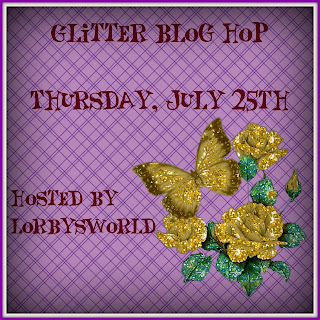 Welcome to the Glitter Blog Hop hosted by Lorby's World. 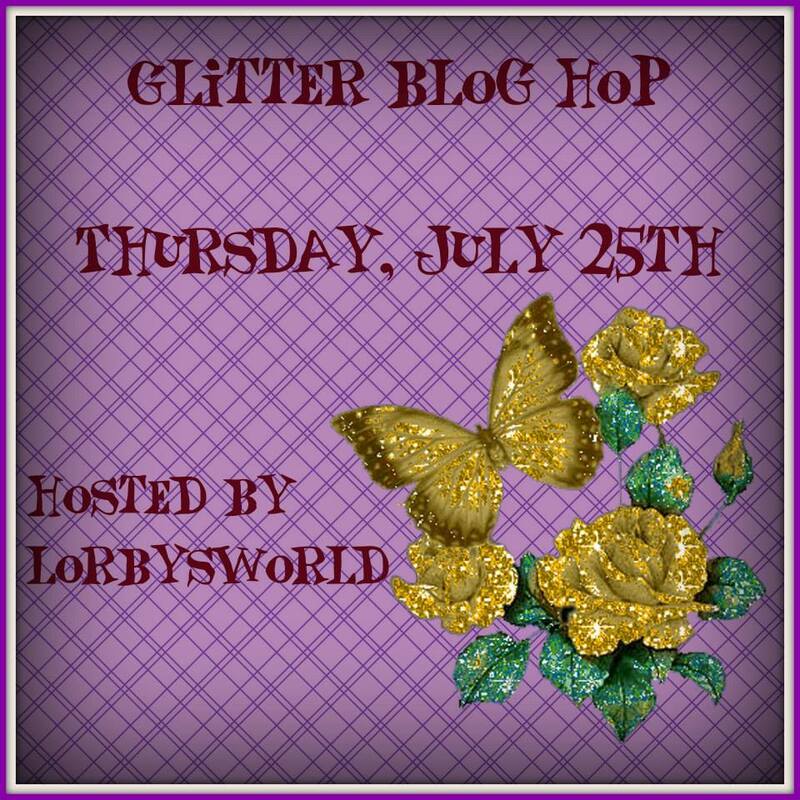 These talented crafters believe a little or a lot of glitter can make any project sparkle and today they are going to prove it with their creations. 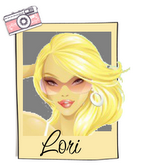 Please visit each participant and leave a little bit of love on their blogs. You should have come from LUCY. If you found me first, please head over to the BEGINNING so you don't miss anything!! Here is a complete line up just in case you get lost along the way!! Jearise from Lorby's World has a special drawing to go along with today's hop. One lucky winner will win a $10 gift card from Michael's. 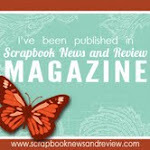 Just leave a comment on her blog so we know you joined us today. The winner will be announced on Sunday, July 28th so make sure you visit that day to see if you are the lucky winner. For my project today, I made a cowgirl boot card for my niece. I started out with a cut from the Silhouette Store. I cut out the card base in lavender. I cut out the boot in patterned purple paper. I cut out the heel and strap in purple cardstock. I inked the edges of the boot with purple ink. I added some purple stickles to the heel and strap and a touch of gold stickles to the snap. I used black gems that were in a swirl pattern to add some funk to the boot! You can see the sparkle here! What a fun card! My niece shows horses at the county fair and loves bling - so this is a perfect card for her! Your next and final stop in the hop is Davinia! Cricut DIVA Lori here with a fun gift bag. I used my Cricut Imagine and Nursery Tail cartridge to make this cute gift bag for my friend's baby boy! 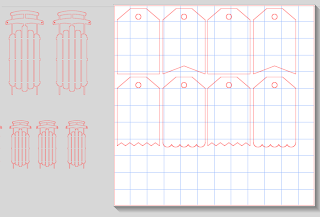 I cut a piece of kraft cardstock to 3x6 inches and folded it in half to make a gift tag. I trimmed the brown paper to 2.75x2.75 inches and put one piece of washi tape on the side. I adhered the paper to the front of the card, and the frog image on the paper. 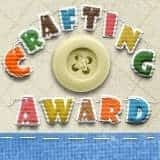 Come over to CricutDIVA to see my and my DT Sister's cricut creations!! This week, our challenge at Frosted Designs is The Great Outdoors. If you love the great outdoors too, consider joining our challenge!! I decided to make a card for my brother as he loves to fish out at his cabin. I found two different fishing images in the Silhouette store. I couldn't decide so I cut them both out along with two different sentiments. At the last minute, I added some extra cuts. I make extra cards to donate. I used some scrap paper (from K and Company) and used some 3 Girl Jam ribbon to represent water. I glued the sentiment on the inside. This card is perfect for my brother. I love the colors in the paper - I feel like I am at the lake! !